Every so often, putting together lectures for the students can provide an opportunity to do something more interesting than just trying to convey some useful stuff about energy systems. It doesn’t happen very often, so when it does it’s worth pursuing a bit. 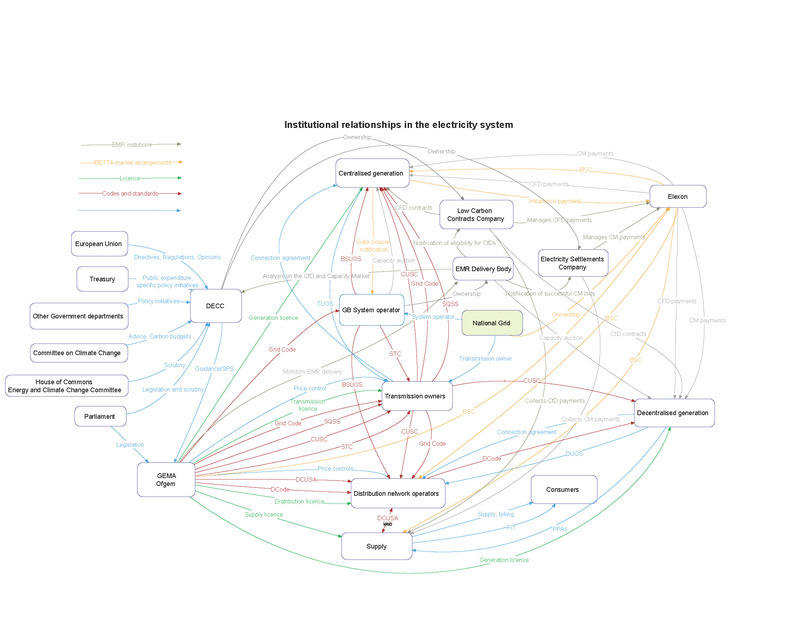 The picture below began life as an attempt to explain to students how the electricity industry was structured in terms of institutions – the legal, technical and regulatory rules which govern how it is operated and managed. It expanded to include the new EMR institutions and organisations. Then it spun horribly out of control. The reason it got a bit out of control was that I was trying to include as many institutional links as possible across the board. As the map developed, a couple of interesting things emerged. The first thing is the sheer complexity of the institutional relationships which underpin the operation of the electricity system – no surprise to anyone who has had a look at the Grid Code or wondered what the Connection and Use of System Code (CUSC) was. Initially, as you would expect, DECC played a central role in the governance of the electricity sector. However, as I added more of the links, especially the various codes and licences which provide the industry with its operating rules, Ofgem became more and more important. While many of the rules originate with other system actors, particularly the transmission and distribution network operators, any changes have to be approved by Ofgem. So while the operational side of the networks is ‘owned’ by the network operators, the actual design of them is shaped and approved by the regulator. This in itself isn’t new, but the extent of the links makes explicit how pervasive Ofgem’s role is in the operation of the system. If – as the IGov project argues – the institutional rules shaping the running of the electricity system are fundamentally important to the future development of the system, then the way that Ofgem designs these codes and licences will be a central plank in that development. This is all very well if Ofgem is an effective regulator with a clear long term vision of how the system should develop to meet the goals of sustainability, security and affordability. However, as we argue elsewhere, this is not the case. Ofgem is too unwieldy and focused on short term economic performance to deliver long term strategic goals, and the Government’s recent draft Strategy and Policy Statement will do nothing to rectify this. What also became apparent after the new EMR arrangements were added was how important National Grid was becoming in shaping the future development of the system. NGC owns the transmission lines in England and Wales, and operates the whole transmission system across Great Britain, so it already has a central role in the electricity system. It also owns Elexon, which manages electricity trading and system balancing, and is responsible for setting the system of payments and penalties which incentivise generators and supplier to keep the system in balance. NGC’s role now also includes running the EMR Delivery Body, which is responsible for modelling future capacity and generation prices for Contracts for Differences and advising DECC on what they might be. It is also responsible for the institutional arrangements which will deliver CfDs and the CM, such as the CM auctions. This role raises the potential for a number of conflicts of interest with NGC’s commercial activities and the Government has put in place measures to mitigate this by ensuring that NGC’s system operator and EMR delivery functions are legally separate. The separation may well work out in practice, and therefore satisfy the strict interpretation of commercial conflicts of interest. However, even if this is the case, that doesn’t necessarily resolve the potential problem of NGC influencing the future development of the system. The EMR arrangements imply a concentration of information – and therefore power – in National Grid as the provider of information and analysis to DECC as well as the implementer of the EMR institutions. This is risky given the breadth of its role across the electricity system, and the fact that its revenue is largely reliant on the established centralised generation model. There will need to be careful monitoring of its operations to ensure that smaller scale, decentralised generation which does not contribute to NGC’s broader business model is not disadvantaged. I know the map is incomplete – it doesn’t include offshore generators or transmission operators, it doesn’t detail the Renewables Obligation arrangements etc. Any thoughts or comments on it would be very welcome. However, even in its current state it shows the degree to which two organisations – Ofgem and the privately owned National Grid – are central to the current operation of the electricity system, and hold key roles in shaping how the system will develop. For anyone interested in playing about with it, the picture was produced in VUE, a freeware concept mapping programme produced by Tufts University in the US. It’s pretty simple to use but if you’re stuck there are instructions here. If you’d like a copy of the map in VUE, please let me know. Bridget Woodman is Director MSc Energy Policy at the University of Exeter. Are some green tariffs greener than others? Could 2016 be the year the Big Six become a memory?